Vatica kanthanensis is a member of the magnificent dipterocarp family. Although this family of colossal trees is well known for its high value timber, aromatic oils and resins, there is still much to learn about V. kanthanensis; a species discovered by scientists from Forest Research Institute Malaysia (FRIM) for the first time in 2013. The species is restricted to Gunung Kanthan, a limestone hill in peninsular Malaysia, where only 50 individual trees have been recorded. The site is home to a number of endemic animals and plants including the recently described tree Meiogyne kanthanensis and herb Gymnostachyum kanthanense both of which are Critically Endangered. 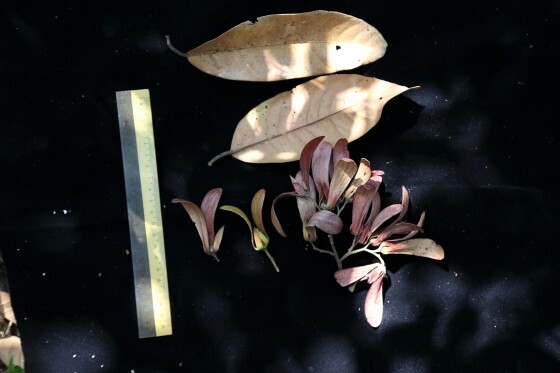 Leaves and fruits from the newly discovered V. kanthanensis. Credit: Forest Research Institute Malaysia. The future of V. kanthanensis and the other species found only in this site is now in doubt. The entire distribution of the species is within a concession being quarried by international cement company Lafarge and the removal of the species’ habitat would almost certainly lead to its extinction. Conservation options for the species are extremely limited. 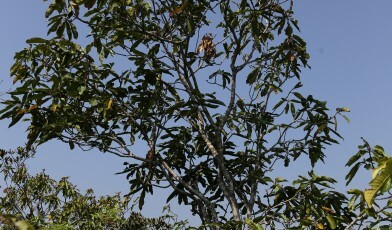 It is impossible to translocate the trees and no seedlings or saplings have been observed since the species was discovered. Furthermore, all collected fruits have thus far failed to germinate – ruling out ex situ conservation as a potential lifeline for the species. Pressure from the international community is growing to cause operations at Gunung Kanthan to accommodate the remarkable endemism of the hill. Lafarge has had some discussions on conservation options with some environmental groups but there is little consensus and it remains to be seen whether planned operations will lead to the extinction of the species or not. A recently discovered species of snail that is also endemic to Gunung Kanthan, Charopa lafargei, now bears the name of the company in the position to decide its fate. Like the snail, the future of Vatica kanthanensis rides on where Lafarge decides to extract cement from this high conservation value hill at Gunung Kanthan. Trees from the Dipterocarp family are the dominant species in Southeast Asia’s rainforests. In some cases, they comprise up to 90% of the canopy layer.